Dastardly villains have captured the governor’s daughter, and it’s up to you to save her. Employ merchants to trade goods, or use your pirates to sink your enemies and steal their treasures. Barter or blast your way to victory! In Black Fleet, players employ their pirates, merchants and occasionally, the Royal Navy to trade for gold, and sometimes just take it. Every turn you will play a movement card to determine where and how you can move, and what you can do when you get there. Swashbuckle your way across the Caribbean, and rescue the governor’s daughter from the Black Fleet. I was intrigued when I saw the Space Cowboys logo on the Black Fleet box. The minds behind games such as Splendor, Elysium, and T.I.M.E. Stories have hit it out of the park once again! If the rich, thematic cover art (by the outstanding Denis Zilber) doesn’t immediately set your mouth to watering, just wait until you open the box…. Instead of listing the different components, I have to gush about the absolutely gorgeous quality of them. The attention to detail on the different types of ships (they have molded slots for the cargo cubes!) is amazing, the “clinky” solid metal doubloons (silver and gold colored) are fantastic, the artwork on the different cards (Action, Fortune, and Development) is lovely, and the large board itself is bright and eye-catching. Heck, the box insert that holds all this treasure is an actual skull and crossbones! Pull this out at your next game night, and heads will definitely turn. Each player takes control of the two of their own vessels—the merchant and pirate ships I mentioned earlier. There are also two “neutral” Navy ships that are looking to sink the pirates. The merchant ships visit different ports and pick up supplies (colored cubes), travel across the treacherous waters, and deliver them to other ports—earning doubloons for each good still on board. The pirate ships sail around these same waters and earn doubloons for attacking those merchants and swiping cargo, and then earn more doubloons by burying it at one of the many islands. What’s a merchant to do? Well, there are two “neutral” Navy ships that are all about seeking out those pirates and sending them to the bottom of the sea (at least until the next turn, that is). Movement is determined by the movement cards. Each card depicts the three different ships and lists the maximum number of spaces that ship can move. Also, the bottom of each card shows how many treasure cards the player must pick up or discard. Those treasure cards give a one-time buff to the player, bending the rules of the game in one way or another. After all ships have been moved, the player is allowed one action per ship: pick up, deliver, or steal a goods cube, bury a goods cube, or attack another ship. The ultimate goal of the game is to earn enough doubloons to unlock all of your four development cards. This is a lot like Machi Koro in this regard, and like the cards in Machi Koro, these development cards give the player special (and increasingly awesome) abilities. Once all four development cards have been purchased, the player must make enough money to purchase the end-of-game Governor’s Daughter card to make it official. The player who has the most doubloons (not necessarily the one who flipped the end-of-game card) is the winner. If you’re looking for a fun, light family game with plenty of opportunities for smack talk, pirate accents, laughter, and “gotchas”, this is it. The rules are easy to pick up (much like those goods cubes), the components, as I’ve already mentioned, are fantastic (just try not to clink those doubloons! ), and the gameplay is quick. Set sail for a great time! My friend said we were going to play a pirate game and I was excited. He told me the name and it was this but I thought he meant Dark Sea which is a game with laying down tiles and this was a game of delivering items to get gold. It was good and it was fun – but why do all pirate games sound alike? I think I would like to play Merchant and Maneuvers next – how is that? I seems like a good pirate game. 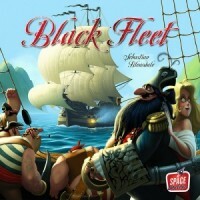 Add a Review for "Black Fleet"